A haven of peaceful greenery 300 meters from the ocean, the 3-star Les Grenettes Hotel is nestled at the heart of a 7-hectare pine forest. Perfect for exploring Ile-de-Ré at your own pace, the hotel is located just a few minutes from the center of the village of Sainte-Marie-de-Ré. The hotel has 46 bright and spacious rooms, and though each one is decorated in its own style, all are designed for your comfort: the size, arrangement and amenities are perfect both for short holidays and longer trips. Our many quality amenities include a view of the palm grove, terrace with patio furniture, sitting area, and Wifi. We have different offers available depending on how many people you are traveling with and what your needs are. Club rooms that sleep 1-3 people are available at a great price. A full apartment rental can sleep up to 6 people. For a holiday that is 100% fun, the Les Grenettes Hotel offers a variety of services. The bar, cafe and fine dining restaurant are open every day. Many recreational activities are also available: we have a boules pitch, tennis and volleyball courts, and ping pong tables. 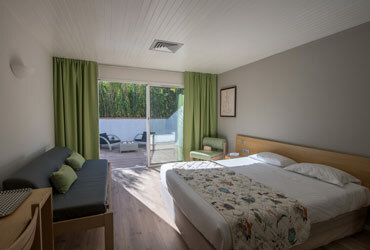 The Les Grenettes 3-star Hotel is also surrounded by play areas for children, and we offer camps during school holidays. The pool area is designed for the whole family: it includes a large pool heated to 27°C, perfect for swimming laps in the morning, as well as two fun pools, one wading pool, and water slides. Dive into our pools and enjoy the water slides. Enjoy fine dining at Le Winch. Take advantage of our many activities. Whether you choose a room, a suite or an apartment, Hotel Les Grenettes offers nights with or without breakfast, and either half or full board. It’s your holiday à la carte according to your needs and schedule: when you book, you can choose one or several local meals to discover the region’s specialties, reserve breakfast and lunch, or choose to eat at the restaurant and do things at your own speed. Kids meals are available for breakfast and the main meals. 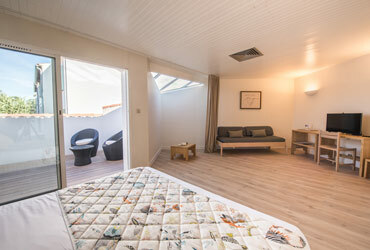 Hotel Les Grenettes is ideal for families with children, both in terms of services and recreation and in terms of room design. Come discover this beautiful island and all of its surprises and of course don’t forget the nearby mainland. The light, the view, the white houses, and the little streets lined with hollyhock will lead you to the beaches, nature reserves, fine dining, and picturesque villages. 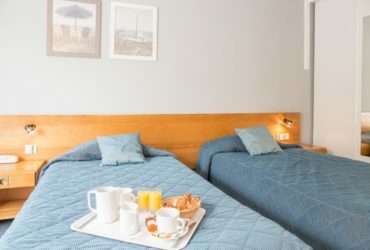 The hotel is located in Saint-Marie-de-Ré, the most populous village on the island (2,600 inhabitants), which you can visit to buy your groceries and enjoy the restaurants and cafes and frequent the quaint little shops. One of our specialties is organizing custom events, all in a gorgeous setting. Our team is here for you. Team building, employee representative committees, events for organizations. Have your dream wedding on an island between beach and pine forest. 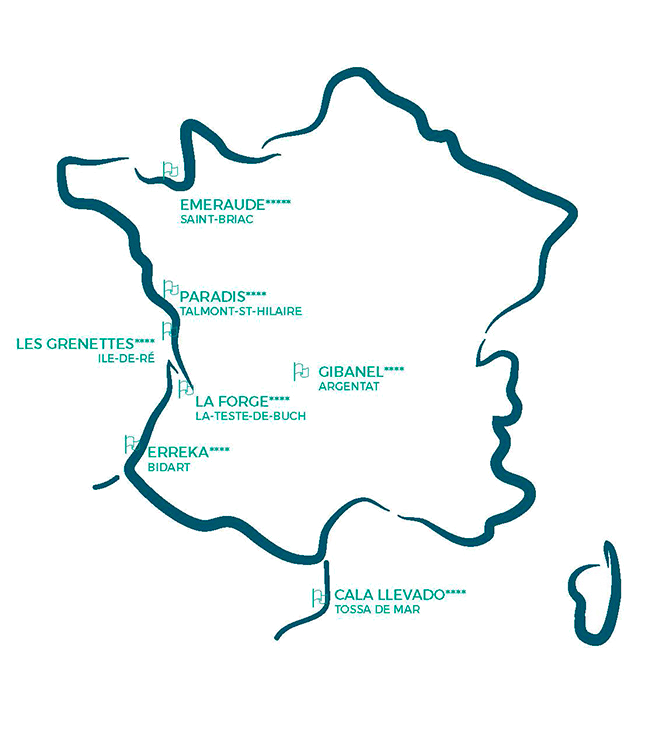 Discover our full board tours on Ile-de-Ré. On both land and sea, our “family of campsites” includes various distinctive places where you can live the good life and enjoy that small-town feeling.